This book gives step-by-step instructions, with helpful photos, for very major homebrewing methods and also features useful charts for brewers to get information at a glance. Hey homebrewers - make better beer! 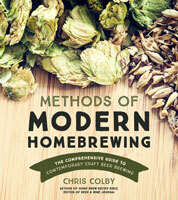 Returning for his second book, Chris Colby highlights the modern brewing methods homebrewers use to make beer. From the basic procedures for making beer from malt extract to advanced all-grain techniques and tests for quality... This book is a beer geek's dream! There is no book like this on the market and a brewer would have to pore through numerous brewing texts, magazine articles and website posts to find all this information. Methods of Modern Homebrewing gives step-by-step instructions, with helpful photos, for very major homebrewing method. The book also features useful charts for brewers to get information at a glance. Appropriate example recipes are given for most of the techniques. Learn to brew with malt extract, by partial mashing or go all-grain. Then move on to master decoction mashing, krausening, high gravity brewing and more. This book will feature 50 recipes and 60 photographs.